When we were in the hospital all Carolynn and I kept convincing ourselves was that when we got home everything would get better. All three of us were in a hospital room 24 hours a day. At times we laughed, most of the time we cried. But the one thing that remained constant was the thought of home. The thought that Gabby would improve once we got home and she was no longer being poked and prodded on an hourly basis by doctors and nurses. Well we got home and it hasn’t worked out the way we thought. The first month home we drove every morning to CHOP for Gabby to get treatments. After that was finished Gabby’s days consist of medications three times a day with Speech, Physical and Occupational therapy pretty much every day. She is still exhausted, she is still terrified most times. When we see family members and friends they comment how great she looks and how good she seems to be doing. I want to scream “Are you crazy”? I know they mean well and Gabby has improved, her balance is getting better and at times her energy level is up. But she still isn’t our Gabby. The last few days her speech seems to have gotten worse. Carolynn and I can make out most of it, much like a new parent can interpret their toddler’s speech. For the last 9 years our yard has at times been the center point of kids playing. There weren’t many days when I came home from work and didn’t see at least 6 to 7 kids playing in our yard. This summer I can count on one hand how many times we have played in the yard. We don’t have a big yard but we make the best of what we have. We have a swingset, an outdoor table, and a pink plastic kiddie pool, what more do you need. We would play ball, run around and play tag, water gun fights you name it there was always a child laughing in the yard. Now it’s quiet, overgrown with weeds and basically just a sad area of land. Gabby’s blood counts have been good so we took her to the pool at the YMCA. She wanted to go. However when we got there she barely lasted 5 minutes in the pool before she wanted to get out. Carolynn and I think it’s because Gabby realizes it’s not how it used to be. She can’t chase the other kids around, can crawl under water, can’t laugh and giggle. So not only did we have expectations but she did as well. When she realizes she’s not able she seems depressed and gives up. There was a commercial on TV forDorneyPark. Gabby wanted to go. We were excited at this spark of interest so we didn’t hesitate. When we got there we triedWildWaterKingdom, Gabby didn’t want to go on the splash pad and spent three hours on a lounge chair as I took the other two kids on the slides. 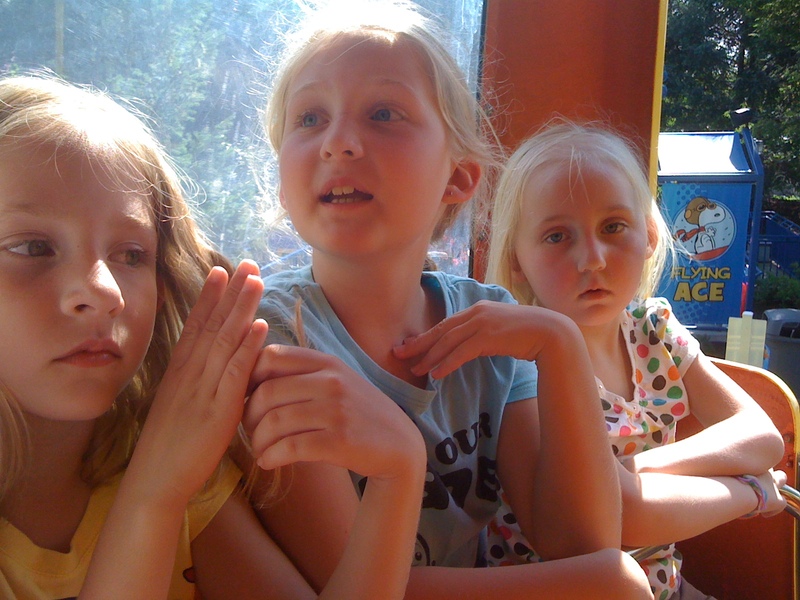 When we went over to Planet Snoopy in Dorney Gabby rode on 5 rides and then told me she was done. She stayed in her stroller the rest of the time. Again we expected something else. A smile, a laugh, some sort of Joy. But it wasn’t there. Just another reminder of how sick our little girl still is. I remember the first radiation treatment Gabby had. A little girl ran by her room getting ready for treatment, Gabby laid in her bed not moving. 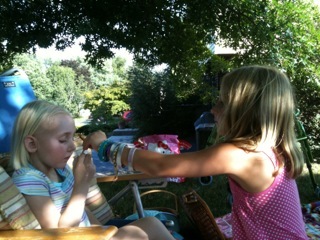 Carolynn asked me if I thought Gabby would be doing that at the end of her treatments. I said I hoped so. Unfortunately that didn’t happen. When we go to clinic we see way to many kids with this horrible disease. And for some reason we focus on the ones that appear healthier, fuller of life and basically ask ourselves, why can’t Gabby be like that. I realize some people will say be happy with what you have. She’s alive; she can sit and eat with us at the table, stop complaining and deal with it. However we are only human we will always want more, we will always want our baby back the way she was. The way we believe she will have to be soon. We are new at this, we don’t know timelines, for healing and no doctor will tell us. I would assume that’s because they don’t know or are tired of giving us bad news. DIPG is a nasty thing, and it keeps growing. In a few weeks Gabby will get her MRI and we will see what’s happening. The word STABLE sounds beautiful at this point. I mean seriously how much more bad news can we get. We are heading out for a few days next week and the beach the week after. Running away. Leaving technology behind, disappearing. We have all these expectations as to what is going to happen. We want to make it the best vacation of our lives for fear that according to the doctors there may not be another one next year. Again I stress we don’t believe that. Our Daughter will somehow, some way beat this. But we will make sure we have fun whether it’s sitting on the beach everyday or sitting in the room playing board games and coloring. Either way we will be away from the dark living room and the quiet yard. When I first started writing I believe one of my first posts was about smiles and not taking them or your kids for granted. When I would come home from work I would be tired, basically we would eat then get the kids ready for bed so we could relax! I think about those times now and I am ashamed, there were some days I wanted to put the girls to bed early just so it would be quiet and I could wind down. I basically took Gabby and them for granted. I always new if I didn’t play with them tonight I would always have tomorrow. Fast forward to now. I can’t say that anymore, all I can do is relive all those times I didn’t play with Gabby when she asked me to, because I was tired from work. I took her beautiful smile and laugh for granted as well. I was reminded of that tonight. After we had given Gabby a bath she told Carolynn and me she only smiles in her dreams while sleeping, she also said she doesn’t talk in her dreams. It was a horrible thing to hear. I sat there looking at a truly innocent five year old girl while she admitted she doesn’t smile while awake. Even today as this is going on there have been days I didn’t want to play, days I didn’t pay attention, days I just wanted to lay in bed and get lost in nothingness but sleep. Even today I’m not always doing what I have said I would do. And why? Because I’m tired? I’m ashamed again because I have no right to be tired, I have no right to pity my life. Gabby is the one going through this hell, we are here to help her, and at times it is so hard to help. However we do, we get up, we do whatever we can to try to get her to smile, get her to enjoy life once again and not settle on the believe that her life is now filled with pain, medicine and speechless dreams. I can write a whole update on school, that’s the next big hurdle; I’ll save that for another time. For the next few weeks we will try to forget what’s happening, try to act our new normal. 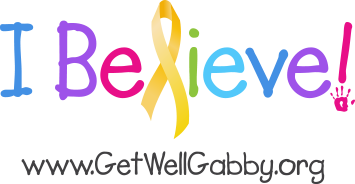 Because after we get Gabby’s next MRI we will have to revaluate all our expectations again. I bounce from acceptance to denial faster than a superball. The summer has been a haze. But Gabby is still here. Tomorrow she will wake up and eat two bowls of rice crispies and a whole lot of ice cream. We are hoping by the end of September we will see her walk, see her smile, hear her laugh, more importantly we Believe she will see and hear those same things. Because when it comes down to it that’s all that matters. This entry was posted in Gabby's Daddy's Blog by John. Bookmark the permalink. Sweet Precious Gabby……You are a VERY SPECIAL LITTLE GIRL as are your sisters!!!! My prayers for you are that you WILL ENJOY MOST DAYS, SMILE AND LAUGH!!!!! SUCH INNOCENT THINGS LITTLE CHILDREN SHOULD DO!!!! JESUS LOVE YOU VERY MUCH!!! I PRAY HE WRAPS HIS SWEET ARMS AROUND YOU & KEEPS YOU SAFE & COMFORTABLE! Those breakfasts of yours sure sound like they ARE THE BREAKFASTS of CHAMPIONS, that’s EXACTLY WHAT YOU ARE A CHAMPION!!!!!! YOU ARE MY INSPIRATION, why you may ask…SIMPLE….YOU GO ON FIGHTING, even if you may want to skip a medicine, you know you NEED IT! Eating, YOU KNOW YOU NEED TO EAT FOR THE STRENGTH! THE LOVE YOU GIVE TO EVERYONE YOU GIVE IT UNCONDITIONALLY, I LOOK UP TO YOU!!!! I PRAY THE DAY COMES THAT YOU WANT TO JUST HOP OUT OF YOUR BED & RUN OUTSIDE BAREFOOT,Swing on the swings, jump rope,play hopscotch. FOR NOW I PRAY THAT YOU SMILE AND TALK, TALK UP A LITTLE STORM!!!! YOU ARE IN THE SPECIAL PLACE IN MY HEART!!!! YOU WILL NEVER WALK ALONE!!! I LOVE YOU SWEETIE!XOXOXOXOXO GOD BLESS YOU & YOUR LOVING FAMILY!!! I totally understand why you would want to scream “are you crazy” I believe in Miracles and I am continually asking for one here. I wear Gabbys bracelet and each time I look at it or catch it on something I offer up anoter request to please make this be over for her and you’r lovely family. I was speaking to someone about this horrible situation that has come upon you and she suggested I read “Heaven is for real” It’s a story of a miracle for a little boy. I am waiting for it to come in. I so hope you guys have some good family time away. If I may suggest one thing that may be good. Ask Gabby to just try a little smile even if she does not feel like it. Sometimes acting out “as if” makes it happen for real. I sure hope I haven’t overstepped any bounderies, I just know from my own life that works. Words that come out of just about every spiritual reading I have ever read, say something to the effect of what you believe is what will be. I’ve been reading all of your updates and wanted to comment every time, but didn’t find the right words. This one really hit home with me. As a Mom who has seen her son fight cancer (leukemia) I can feel your pain. Cancer changes everything, nothing is the same anymore. Not only do you see your child go through all this stuff, but at the same time you have to grieve for your past lives. Even when the chances of beating this horrible disease are good, as they are in my son’s case, life still is not the same and never will be. You always live with the “what ifs” and the fear. I wouldn’t dare compare our situation to yours, I know you’re going through a whole lot more than we are, I just want you to know that you have every right to feel the way you do. You have every right to complain and ask “why”. Unfortunately it won’t get you anywhere. I had a stillbirth a few years back with our third child and I compare that to our situation now. We have been blessed to know and be with these children for a few years, isn’t that still better than never have met them at all? I know it’s still so unfair to have known them and loved them only to possibly have them taken away. We can’t focus on that. We have to focus on today and try not to worry too much about tomorrow. That’s hard, but I find that helps me cope.Your guys are amazing parents and you shouldn’t doubt that for a second. We have found ourselves saying the same thing: “who are we to complain about anything, when our child is the one going through all this?” But you are going through everything just as much as Gabby is. Just know there are a lot of people out there, who know exactly how you feel and what you’re going through, I know that might not make a difference, but maybe it’s a little comforting to you to know that you’re not alone. We are all thinking of you guys daily, praying our little hearts out and trusting that Gabby will beat this. Take good care! Thank you so much for sharing your feelings with us. Your words help us focus on the now and help us all take so much in perspective. The community, near and far, hold you all in our prayers that she will beat this, and that your family and close friends stay as strong as you can through it all, and hold your hands and lift you all up when you feel weak and beaten. Please try to not be so hard on yourself, as you said we are all only human. I do understand how wonderful the quiet of bed time is for parents … and I can only imagine the agony that you’re going through. Love and prayers and support. I know you get a lot of comments about believing that everything will be better and you should never stop doing that, but the fear is real. It might help Gabby to hear from you that it is OK to be afraid, OK to not feel like smiling. If you try to get her to act like everything is good it might make her feel bad for feeling the way she does. Tell her that everything she is feeling is normal and that you are feeling it too. It is all well and good to tell her how strong she is but just like you don’t feel strong she knows it doesn’t sound quite right too. If you tell her everything is OK it sounds like a lie. I might sound a bit cold, I know. The important thing is that you hold on to each other and learn to live around the fear. Don’t try to stop being afraid, the more you acknowledge it the more you can help each other through it. A quote I got from a bottle of tea: “Courage is not the lack of fear, but the determination that something else is more important than fear.” Love and prayers to all of you. I do not know you, or Gabby or your family. But, I was thinking about taking my 93 year old Dad to the Bingo fundraiser for Gabby tonight and I decided to try to find out more about her. I am so very sorry that Gabby is going through this. No child should have to suffer the pain she is enduring. I just thank God that she has parents like you and your wife. John, I am writing to suggest that you say a novena to St. Padre Pio. As I am sure you know, he is a most important Saint for healing. I have said his novena many times and Padre Pio has always listened. I will keep Gabby in my prayers. I’m not very good at getting my thoughts accross .. so please know that you are all in my thoughts and prayers!! You have a beautiful family!!! After reading the Updates it gets tears to my eyes everytime ,it is realyy very difficult time for all of you.Please share Gabbys moments with all.